BIRMINGHAM, Ala.—On Thursday, Eagle Forum of Alabama President Eunie Smith and Foundation President Jim Cooper announced Becky Gerritson as its new Executive Director. Becky has been a strong advocate for conservatism in Alabama since founding the Wetumpka Tea Party in 2009. In 2016 Gerritson received Heritage Action Sentinel’s Firewall for Freedom Award, was named in Yellowhammer’s 2017 Power and Influence List, and was on AL.com Twenty Most Influential List in 2015. Becky Gerritson gained national acclaim for her testimony before Congress after Obama’s IRS unfairly targeted the Wetumpka Tea Party and other organizations for their conservative beliefs. She has been lauded by conservative figures across the country such as Rush Limbaugh and Fox Business’ Stuart Varney. Gerritson was a Republican candidate for Congress in Alabama District 2 in 2016. 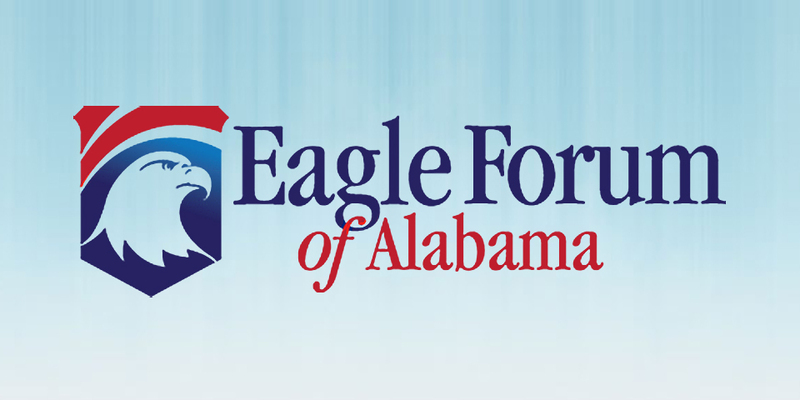 The mission of Eagle Forum of Alabama is to equip and activate citizens with timely information from a conservative, constitutional point of view on public policy issues that affect the family. 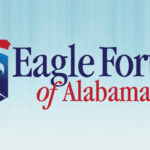 For more information about Eagle Forum of Alabama, please visit www.AlabamaEagle.org. Pro-abortion forces have raised over $940,000 mostly from out of state Planned Parenthood affiliates to flood Alabama airwaves with false information in an attempt to defeat the Alabama Sanctity of Unborn Life Amendment which is on Tuesday’s ballot. Under current law, the Alabama constitution does not include any language that directly relates to the importance of unborn life or the rights of unborn children, nor does it include any language that directly relates to abortion or the funding of abortions using state funds. The proposed amendment does not identify any specific actions or activities as unlawful. It expresses a public policy that supports broad protections for the rights of unborn children as long as the protections are lawful. If a majority of voters vote “Yes” on Amendment 2, the public policy of this state will be to support and protect the importance of unborn life and the rights of unborn children. 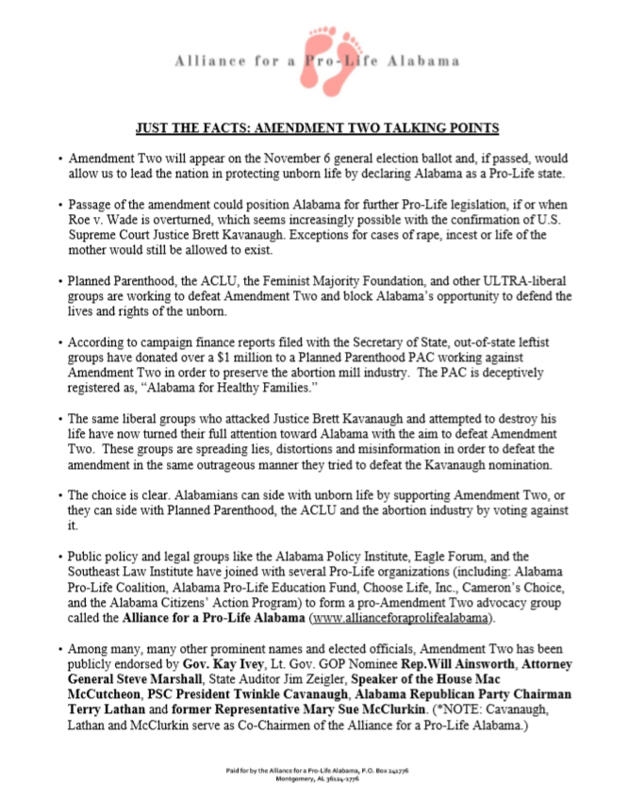 To advocate for this amendment, Eagle Forum has joined forces with the Alabama Policy Institute, the Southeast Law Institute and several Pro-Life organizations including: Alabama Pro-Life Coalition, Alabama Pro-Life Education Fund, Choose Life, Inc., Cameron’s Choice, and the Alabama Citizens’ Action Program. Under the banner of Alliance for a Pro-Life Alabama, the coalition is chaired by three pro-life champions: Former State Rep. Mary Sue McClurkin, State Republican Party Chairman Terry Lathan, and Public Service Committee President Twinkle Cavanaugh. 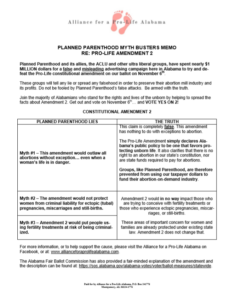 To refute the lies in the pro-abortion ads, click here for the document Myth Busters or see below. Please share this email with your contacts and ask them to vote for Amendment Two to protect babies in the womb. Pray for God’s grace on America in this critical election! 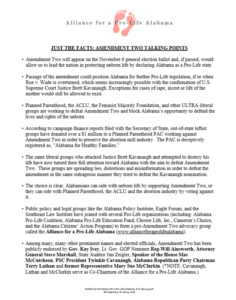 Copyright (C) 2018 Eagle Forum of Alabama All rights reserved. Click on the graphic below to read. Our state constitution has strong language related to religious liberty, but this amendment makes clear that a person’s religious beliefs will have no effect on his or her civil or political rights. It also makes clear that the Ten Commandments may be displayed on public property so long as the display meets constitutional requirements, such as being displayed along with historical or educational items. Amendment 1 also provides that no public funds may be used to defend this amendment in court, so funds for its defense would have to come from private sources. 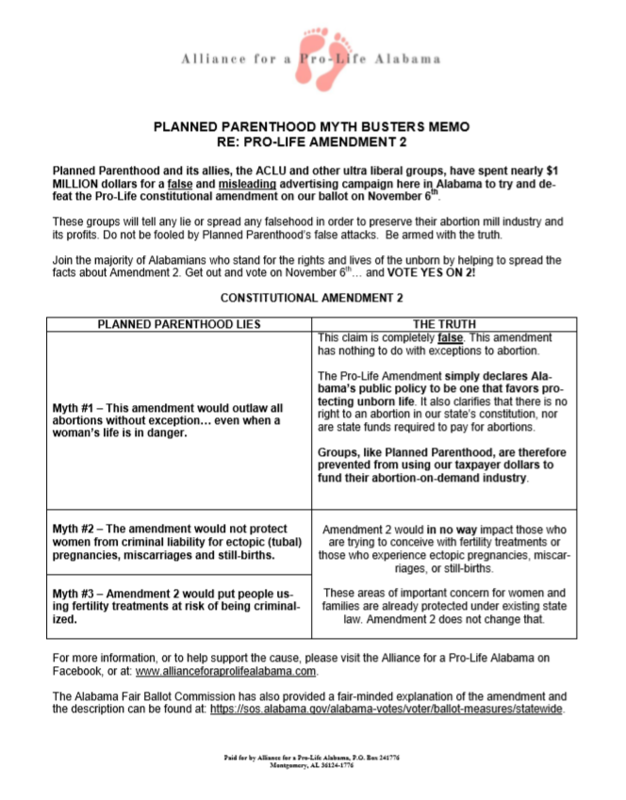 “Proposing an amendment to the Constitution of Alabama of 1901, as amended; to declare and otherwise affirm that it is the public policy of this state to recognize and support the sanctity of unborn life and the rights of unborn children, most importantly the right to life in all manners and measures appropriate and lawful; and to provide that the constitution of this state does not protect the right to abortion or require the funding of abortion. Amendment 2 provides that it would be the public policy of the state to recognize and support the importance of unborn life and the rights of unborn children, including the right to life; and to protect the rights of unborn children. Additionally, the amendment would make clear that the state constitution does not include a right to abortion or require the funding of an abortion using public funds. This also may be considered to be a preemptive measure such that if or when Roe vs Wade is overturned and the issue returned to the states, this amendment would provide a legal framework for abortion to be declared illegal in Alabama. Under current law, the University of Alabama Board of Trustees is composed of 16 people: three members from the congressional district in which the Tuscaloosa campus is located, two members from each of the other six congressional districts in the state, the Governor, and the State Superintendent of Education. So, if the number of congressional districts in Alabama increased or decreased in the future, the number of trustees would also increase or decrease. Additionally, other than the Governor and the State Superintendent of Education, current law requires a trustee to retire from the board following his or her seventieth birthday. Amendment 3 does three things. First, it provides that the board will be composed of members from congressional districts as those districts existed on January 1, 2018, meaning any future changes to the number of congressional districts in Alabama would not impact the number of board members. Second, it removes the State Superintendent of Education from automatically having a seat on the board. Third, it allows a trustee to serve after his or her seventieth birthday. Under current law, members of the state legislature are elected to four-year terms of office that begin and end on Election Day in November. This four-year period is known as a quadrennium. When a person who was elected to serve in the state legislature is unable to complete his or her term, a vacancy is created. When this vacancy occurs, the Governor is required to schedule a special election. The winner of the special election fills the vacancy for the rest of the term. Amendment 4 provides that when a vacancy occurs in the state legislature on or after October 1 of year three of the four-year term, the seat will remain vacant until the next general election, which occurs in November of the fourth year of the term. The practical application of this amendment is that if a special election is called after October 1, by the time the Governor calls the election, the party qualification process takes place, the primary elections are held and then the general election is held, the winner would not be in office until the last days of the session or even after the Legislative session is over for the 4th year of the quadrennium, then the whole process , must be repeated for the upcoming November election. Thus, this amendment would save the state the costs of these special elections. PROPOSED LOCAL AMENDMENT NUMBER ONE (1) Relating to Shelby County, proposing an amendment to the Constitution of Alabama of 1901, to require that the members of the county board of education and the county superintendent of education be elected by the qualified electors of the county residing outside of the corporate limits of any city with a separate board of education. If this amendment passes, only those voters who reside is areas covered by the Shelby County School System will vote on members of the Shelby County Board of Election. Tom Fredricks, Attachments and Full Answer to Question 1 and 16.